The Washington DC area can be the toughest place to move to. It's hard enough to figure out the different cities, counties, and school districts. The best way to learn this information is from other military families. This PCS Guide to Washington DC Area is a compilation of information from other military families. Download the full PCS guide with maps to see where the neighborhoods are located, metro maps, school boundaries and much more! The District of Columbia is located in the middle of Maryland and Virginia (called Norther Virginia "NOVA"). Many of the military bases listed above are located in either D.C., Maryland, or Virginia. Washington had an estimated population of 693,972 as of July 2017. Commuters from the surrounding Maryland and Virginia suburbs raise the city's population to more than one million during the workweek. The Washington metropolitan area, of which the District is the principal city, has a population of over 6 million, the 6th largest metropolitan area in the country making it a very difficult place for military families to find where to live. Things to Consider When PCSing to D.C.
2. Most people stay in the area where they live. For example, Maryland residents don’t like to go to Northern Virginia (NOVA) and vice versa. 5. Be prepared for your spouse to work long hours. 6. Expect a normal commute to be at least 30 minutes to an hour to an hour and a half. 7. You need a realtor to help look for houses to rent or buy. The property market moves fast here. If you are looking at homes across state lines, make sure your realtor has licenses for different states (Virginia, DC, and/or Maryland). Find a recommended Military Friendly REALTOR near The Pentagon area. Read real estate agent reviews from other military families. 8. Get a GPS which has updated information and gives you the best routes. Maps on cell phones may not have the best route and/or they may not be allowed in the future with the new texting/cell phone laws. 9. Make sure you have AAA and/or USAA if you run out of gas or break down. 11. DC area BAH is higher than Quantico’s BAH. 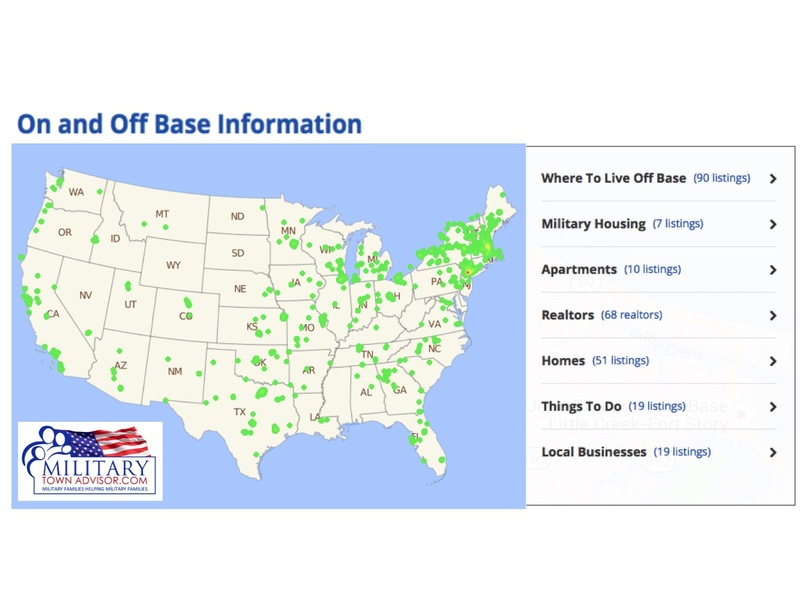 If you are attached to Quantico, but choose base housing on Fort Belvoir, you may owe the difference in BAH. Always, call housing to confirm. 12. Consider enrolling in US Family Health Care Plan for the area. You will have access to Johns Hopkins physicians. Read more. 1. Known for their state schools, especially Fairfax County Public Schools. 2. If buying a home, VA tends to have higher home prices, but lower taxes than DC or Maryland. 3. Lots of neighborhoods with an overall neighborhood feel. 4. Lots of upper middle class areas. 1. The most recommended school district seems to be Montgomery County. Also, many recommend Anne Arundel County, and Howard County which are closer to Ft. Meade and Annapolis. 2. If buying a home, MD tends to have lower home prices, but higher taxes than VA.
3. A good mix between upper middle class and lower socioeconomic areas. 1. The district is separated by 4 quadrants NW, NE, SE, SW.
2. NE, SE, & SW quadrants tend to have higher crime rates, making the North West (NW) quadrant a more desirable area to live. The City of Alexandria has great walkability to shops. Old Town is a unique area with quaint shops, restaurants and boutiques. The City of Alexandria is more crowded and expensive than other areas in Alexandria. This area is north of the 495 Beltway and is run by Alexandria City Public schools, which has some high rated schools, as well as, low rated ones. The City of Alexandria has a lot of charm and is very desirable, however schools, traffic and home prices might be a determining factor if you choose to live in the City of Alexandria. Read more about the differences between the City of Alexandria and Alexandria. The part of Alexandria (located outside the 495 Beltway called non-Alexandria / Lower Alexandria / or South Alexandria) which is run by Fairfax County and is aligned to Fairfax County Public Schools. Schools, traffic, and home prices are the biggest difference between the City of Alexandria and the rest of Alexandria. Many military families moving to the DC area want their kids to attend Fairfax County Schools. The area is small enough to get around without much traffic, it’s close to Mt. Vernon, Ft. Belvoir for the commissary and healthcare, and it’s close enough to Old Town to drive to shops and wonderful restaurants. It’s close to metro, freeways, and GW Parkway (which you can take all the way to the Pentagon). If looking in this area, read about 5 amazing neighborhoods, recommended by other military families. Also, Kingstowne is a great master panned neighborhood. Ft. Hunt has a lot of nearby shopping on Rt 1, as well as, Old Town. Great neighbohroods and family appeal. Commuting from Alexandria or City of Alexandria TO the Pentagon– use the GW Parkway, you can drive or choose to ride your bike 12 miles down the GW Parkway to the Pentagon especially during the beautiful spring, summer, and fall months. Metro -The closest Metro station is Huntington Metro Station, which is the end of the yellow line. If you live further from the Metro in Mt. Vernon or Ft. Hunt areas, Metro buses run through lots of neighborhoods. You can walk from your house to a Metro bus, ride the Metro bus to the Metro and take that directly into the Pentagon, Crystal City, Washington DC, etc. Huntington Metro Station also has parking available there if you would choose to park and take the metro into work. Commuting from Kingstowne to Pentagon is about 45 minutes. You can drive or take the bus from neighborhood to Metro Station- Van Dorn to Pentagon. Commuting from Alexandria/Mt Vernon/Ft. Hunt TO Fort Belvoir Army Post your driving commute is 10 minutes. North and South Arlington is separated by Route 50. North Arlington is typically safer and has larger, more expensive homes. There is less pockets of lower income families which usually indicates higher test scores and higher property values. Many homes in North Arlington are very expensive and may be out of the price range of some military families, however there are quite a few military families who live in North Arlington. Pros to paying above BAH in North Arlington are great schools, short commute, and a great community. South Arlington is typically made up of smaller houses, commercial areas, and apartment complexes. This area is a bit more diverse. There are pockets of family friendly neighborhoods in South Arlington. View a map of North vs South Arlington. Nearby neighborhoods: family friendly neighborhoods near Arlington, VA.
Commuting from Arlington TO Pentagon and DC – Drive or use Metro Stops. Arlington is very close to the Pentagon and DC. Nearby neighborhoods: family friendly neighborhoods near Annandale. Burke gives you more for your money. Burke has great schools that are aligned to the Fairfax County Public Schools. Burke has Burke Lake Park and a lot of parks and trails. Read the Buzz about Burke for more info. Burke has 2 Secondary Schools which serve grades 7-12. Each has a large campus with the middle school and high school having its very own section of the school. Nearby neighborhoods: family friendly neighborhoods near Burke, VA.
Popular neighborhood, the Burke Centre Conservancy, is the heart of Burke and is made up of 5 neighborhoods each with it’s own community center and a pool. These neighborhoods are rich with family friendly activities including walking paths, tot lots, tennis and basketball courts as well as Burke Lake. Commuting TO Pentagon and DC- Use Franconia Springfield Metro station, which is the end of the Blue Metro line. Metro buses run throughout the Burke neighborhoods, pick up commuters, and head straight to the Pentagon making for an easy commute. Parking is available at the Franconia Springfield Metro station for commuters. Metro buses are also available for commuters to bus to the Metro station and then take the Metro into work. Nearby neighborhoods: family friendly neighborhoods near Springfield, VA.
Commuting TO the Pentagon from Burke or Springfield – use the Express Buses or the VRE. Lorton is located further away from DC than other popular areas. It has strip malls and it's closer to Ikea/Potomac Mills Outlets. Lorton is close to Woodbridge, Occoquan and the beltway. Lorton is very close to historic Occoquan which is a quaint town with shops and water access for boats. Lorton has commuter buses, REX bus, VRE. Lorton has commuter buses, REX bus, VRE. Commuting TO DC would be about an hour by car. Commuting TO Belvoir would be about 10 minutes by car. Commuting TO Quantico would be about 30 minutes by car. Popular areas surrounding Quantico Base are Woodbridge, Dale City, Montclair, Stafford, and Aquia Harbour. Read on base reviews and off-base neighborhood reviews. Read about popular off base apartments near Quantico, especially good during TBS. Schools at Quantico base are DoD schools. Falls Church has a lot of small shops that gives it a small town feel. You can easily find a good mechanic, a local produce market, tailor, and cute little brick library. Falls Church has a lot of walking/biking paths, parks, playgrounds, and activities, as well as good proximity to DC. Falls Church Vs City of Falls Church. Route 7 is the main corridor of Falls Church with Seven Corners on one end, and Tysons Corner on the other. City of Falls Church – The City of Falls Church is NOT part of Fairfax County Schools. Schools are run by Falls Church Public School System. Falls Church – The part inside the 495 Beltway has Falls Church zip codes, addresses, and IS part of the Fairfax County School System. Nearby Neighborhoods: family friendly neighborhoods near Falls Church, VA.
City of Fairfax has a suburbia feel, with lots of big box shopping. Downtown city of Fairfax has more of a small town feel with small shops. There are lots of independently owned restaurants, in addition to chain restaurants, providing lots of different types of cuisines. The public schools in the City of Fairfax are owned by the city, but administered by the Fairfax County Public Schools system under contractual agreement with Fairfax County. Find schools here. Nearby Neighborhoods: family friendly neighborhoods near Fairfax, VA.
It’s quiet, away from the bustle of the city, with tight communities that are filled with good schools, friendly people, and walking trails to everywhere! There is a Giant, Starbucks, CVS, and small hair salons within 5 miles, but big stores like Target, Walmart, HD....etc are all about a 15/20 minute drive. 20 minutes to get anywhere. Nearby Neighborhoods: family friendly neighborhoods near Fairfax Station, VA.
Popular neighborhoods: Crosspointe, Barrington, South Run Oaks and Timber Ridge. Commute to DC about 35-40 minutes driving depending on route and traffic. There are buses or metro stops that are located throughout the area you can drive to and take into the city. Vienna has a very small town feel but still offers access to many big box stores, malls, shops, etc. and is very close to Tyson's corner mall and metro stops. Vienna has great restaurants. The "Main St" is Maple Ave, and there is a historic area in the center of town. It is west of 495 beltway of DC so it has a bit of a slower pace of life. The location is central and the schools are Fairfax County Public Schools. They have lots of community festivals, Viva Vienna in the spring, Taste of Vienna (which showcases lots of the local restaurants), an Annual Halloween Parade, and Christmas Stroll on Church Street. There is a good mix of big box shops and mom/pop shops. They also have really good sports programs for kids. Nearby Neighborhoods: family friendly neighborhoods near Vienna, VA.
Commuting TO Pentagon or DC, use the Metro or the HOV lane. Vienna also has a metro stop, which is very convenient, although on the outskirts of town near I-66. McLean is very similar to North Arlington with quaint neighborhoods, good restaurants, boutique style shops, and great schools. Its proximity to I-495 makes it a desirable place to live. McLean is located close to Tyson’s Corner, which is the 3rd largest mall in the country. It has great shopping! Tyson 1 is chains, Tyson 2 is high end designer shopping. Rent and home prices are very pricey, while some military families live in McLean and are willing to pay high prices for shorter commutes, good schools, quaint neighborhoods and a great community. McLean schools are aligned to Fairfax County School District and have some of the highest rated public schools. 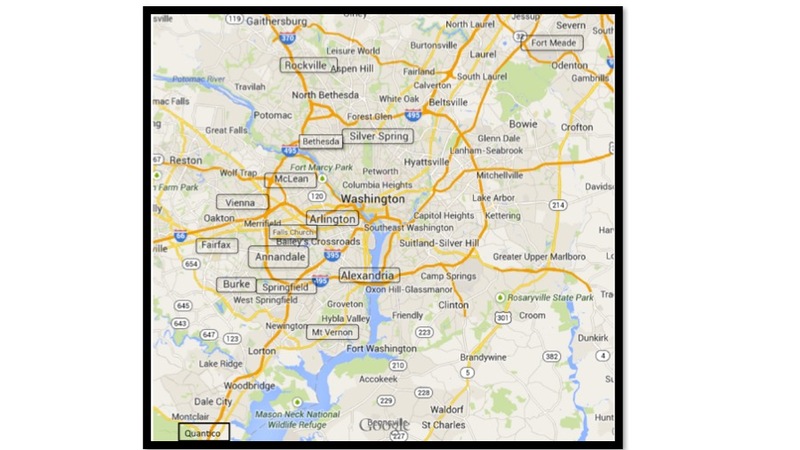 Nearby Neighborhoods: family friendly neighborhoods near McClean, VA.
Commuting TO Pentagon or DC - Use GW parkway. New Silver Line Metro is set to open in McLean in March 2014. Communing TO CIA Headquarters - Located in McLean, VA so commute is 5-10 min. These areas are more affordable and have lots of new construction. Reston Town Center and surrounding areas are actually fairly well built up and have a great, fun feel. Commuting - You have access to the Dulles Toll Road. The Dulles Toll Road is a flat $2.50 for 2 axle vehicles if you enter/exit at the main toll plaza off 495 and $1.00 if you enter/exit at any of the other toll booths. The Silver Metro Line runs out to McLean and Reston and has an express bus directly to the Pentagon. Nearby Neighborhoods: family friendly neighborhoods near Reston, VA.
LEESBURG, VA – Lots of farms and horse communities. The new Silver Line will go out that way. Bethesda is a wonderful place to live if you are stationed at Walter Reed. Featuring some of the best schools in the area, Bethesda is a large and more metropolitan suburb with lots of high-end shopping, restaurants, and entertainment options. Downtown Bethesda has an urban feel with high rise condos and excellent walkability to shops, restaurants and outdoor plaza style activities. Bethesda is located just above Chevy Chase, which is one of the most expensive areas to live in DC. The cost of housing is higher in Bethesda than much of the surrounding areas, but it features lovely and safe neighborhoods, high walkability, and quick access to DC. Tucked just inside of the Beltway, you never need to get on a major highway to get to Walter Reed, all parts of the city, or into the District itself. Surface street traffic can be bad during rush hour, but with a short distance to go for most people, it is extremely do-able. Bethesda features a wide array of housing including trendy studio apartments, townhome style condominiums, small single-family homes, and large and impressive estates. Schools are aligned to Montgomery County Schools. Check school boundaries. Nearby Neighborhoods: family friendly neighborhoods near Bethesda, MD. Commuting to DC - Bethesda has several stops of the western branch of the red line of the Metro, which can easily convey you into the city. Commute to other bases -it is necessary to commute on the beltway or go through the District, which can take a long time. Silver Spring is a very diverse and large suburb just to the North of Washington, DC and a great option for anyone stationed at Walter Reed, and potentially the Navy Yard. Silver Spring occupies a large part of the map with lots of unincorporated parts of the town. They are cleaning up these areas, but many parts are still transitional. Downtown Silver Spring is a bustling, urban suburb. It is a very diverse and culturally focused city known for lots of public events and for its recently re-gentrified and vibrant Town Center. With a wide variety of restaurants, shops, and entertainment options, and numerous living options very close to the eastern branch of the Metro, it offers convenience to the District, with the advantages of the suburbs. The non-downtown part of Silver Spring is much more suburban and similar to Rockville and Gaithersburg in many ways. The schools are part of Montgomery County Schools, which are widely regarded as good, but the more urban schools in Silver Spring are not as good as others in the area. Schools are aligned to Montgomery County Schools. Check school boundaries. Nearby Neighborhoods: family friendly neighborhoods near Silverspring, MD. Commuting TO DC - Silver Spring is very close to the red line and has 4 stops on the Metro. Silver Spring is a short commute (by car or Metro) to Washington, D.C. If you do drive, you're likely on city streets which move, but can become bottlenecks. Another option is the beltway which has lot of traffic during commuting hours! Rockville is a family friendly, large suburb just north of Bethesda with good schools, a lot to do, and safe neighborhoods. The schools are part of Montgomery County Schools, which are widely regarded as good. Rockville occupies a large area on the map, so commuting times vary greatly on which part of town you live in. Rockville has a large downtown known as Rockville Town Center with shopping, dining, and entertainment. There are also numerous smaller shopping centers featuring pretty much every major chain restaurant or store you can imagine. Housing types vary depending on the area of the city. The main thoroughfare through town is Route 355, or Rockville Pike. This is the busiest part of town and stretches south to Bethesda and north to Gaithersburg. Many luxury apartments and townhome communities can be found right along “the Pike” as it’s known. Once you veer off the Pike, there are quiet, single family home neighborhoods. Price ranges for these homes vary greatly. In general, the north and eastern parts of town are less expensive than the southern and western parts that border Bethesda. Schools are aligned to Montgomery County Schools. Check school boundaries. Commuting TO DC -Rockville is serviced by several stops of the western branch of the Red Line of the Metro. Commuting TO Walter Reed can be by the Pike, or by the 270 Freeway. 270 is known for horrendous rush hour traffic, but is a trade off for larger housing. Commuting to other bases - To commute to other Bases in the area, it is necessary to take the Beltway. Gaithersburg is very similar to Rockville, it’s southern neighbor, and features more “bang for your buck” with housing. The schools are part of Montgomery County Schools, which are widely regarded as good, though the actual ones in this town are not as strong as Bethesda or Rockville. Gaithersburg is more of your typical suburbs – lots of new developments with townhomes and single-family homes, and virtually every big-box and major chain store that you can imagine. Gaithersburg doesn’t have much of a “town” feeling and the atmosphere is more predicated by the actual neighborhood you live in. Schools are aligned to Montgomery County Schools. Check school boundaries. Commuting TO Walter Reed would be by freeway 270, which has horrendous rush hour traffic, but a trade off for the lower cost of living. Commuting TO DC - The southern part of Gaithersburg has the last stop on the western branch of the Red Line of the Metro. There is a large “park and ride” garage for those who wish to commute into Rockville, Bethesda, or the District. Commuting to other bases in the area would be lengthy – with a good stretch on 270 and the Beltway. Kensington is a small town in the midst of one of the busier parts of Montgomery County, and a great option for anyone stationed at Walter Reed. With Rockville and Silver Spring to the North East and North West, and Bethesda to the South, Kinsington occupies a small plot of land, but is known for its involved citizenry, year round farmer’s market, and charming historic downtown area complete with antique shops, cafes, and Mom & Pop businesses. The incorporated part of Kensington channels students to the Bethesda schools, which is a huge plus for this town. The unincorporated part of Kensington sends students to the nearby Rockville or Silver Spring schools, which are good, but not as strong as the Bethesda schools. Most housing options in Kensington are single family homes in established neighborhoods. Schools are aligned to Montgomery County Schools. Check school boundaries. Commuting to Walter Reed is a cinch, with less than 5 miles from downtown Kensington to Walter Reed. Commuting to other bases would be possible via the Beltway. While there is no Metro stop in Kensington, it does have a MARC train (Maryland commuter rail) station and is smack dab between the two branches of the Red Line with most nearby stations offering a park and ride garage. For more information on areas in Maryland, go to our PCS Guide for Fort Meade / Annapolis. The district is separated by 4 quadrants NW, NE, SE, SW. The general rule of thumb is that the closer you get to the Capitol building the more crime. NE, SE, & SW quadrants have higher crime. North West (NW) DC is a popular area to live. NW Washington DC (also known as Northwest DC) is located north of the National Mall and west of North Capitol Street. The largest of the four quadrants, NW Washington DC, contains most of the city’s federal buildings, tourist destinations, and wealthier neighborhoods. It encompasses the areas known as Penn Quarter, Foggy Bottom, Georgetown, Dupont Circle, Adams-Morgan, Columbia Heights, among others. Major attractions in NW include the museums on the north side of the National Mall, Verizon Center, National Cathedral, the White House, Rock Creek Park and many more. Arlington's Rosslyn-Ballston corridor; Clarendon (bars, shops with above condo and apartment living); Old Town Alexandria; Tyson's Corner- fabulous condos in these locations...very trendy, night clubs, restaurants, metro stops, etc. Check out the NEW Silver Line near the Dulles Toll Road Area. I-66 – Runs East and West through NOVA ***VERY IMPORTANT** It is HOV2 inside the beltway (basically from Falls Church to DC). So unless you have 2 people in your car, you can't use 66 from Vienna to the Pentagon. However, if you are traveling westbound in the morning and eastbound in the afternoon you can use I-66 going against traffic without HOV restrictions. Check out their website for more information. HWY 267 - If you live in a town along the Dulles Toll Road, it is very expensive. During peak commuting hours it's $5.10 with an EZ pass, one-way. Check their website for more info. Beltway 495 - “The Loop” is usually grid lock during peak hours. They Beltway 495 has HOV lanes for commuters. Did you know that you can get reimbursed for part of your commuting expenses? Public School Districts around D.C.
Fairfax County Public School System – Fairfax County Schools is a very sought after school district in the Northern Virginia area. Below is a map. The boundaries of Fairfax County Schools system can be confusing. Make sure to use their address finder to be exact. Find recommended local businesses around D.C. and find a directory of fun things to do around D.C.
Once you get to your new duty station, it's time to get out and explore. Let us help! Subscribe below to receive information about your new town below. Whether you are looking to buy or rent a home near Fort Hood, search our large database of Military Friendly Realtors near Pentagon. Real estate agents can help you narrow down your search and keep you in the loop when houses come on and off the market. Search MilitaryByOwner's military homes for sale or rent near Pentagon. I understand that your time and knowledge is valuable so I’d like to reward you for writing reviews. The motto of this website is to Pay It Forward and help other military families. You are paying it forward by sharing your knowledge and advice with other military families, and we are paying it forward by rewarding you for your time with Amazon gift cards!